Benny Harmse of Continental Tires the Americas poses at the Mount Vernon, Ill., facility. The rubber industry was an active sector during 2013. There were acquisitions and expansions, along with court battles, price-fixing charges and a relatively calm round of master contract negotiations with the top three tire makers and the United Steelworkers union. At the center of it all, though, was the planned purchase of Cooper Tire & Rubber Co. by Apollo Tyres Ltd., a deal that still isn't completed and is the subject of a court case. Goodall Rubber Co. of Canada moves to beef up its primary hose plant's space and production capacity. Trelleborg A.B. 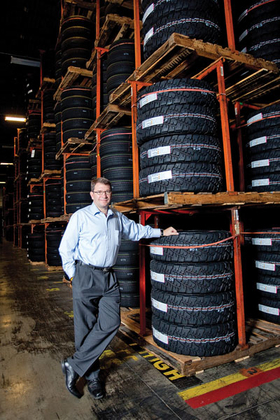 continues its era of expansion, completing its purchase of Maine Industrial Tire L.L.C. and expanding a factory in England to serve the oil and gas field. The ACS Rubber Division devises a new name for its fall conferences and expos—the International Rubber Conference. Dash Multi-Corp.'s founder sells the maker of recycled rubber products, among other items, to Arsenal Capital Partners. Agricultural tire maker Mitas Tires North America Inc. announces plans to continue to expand its Charles City, Iowa, factory. R.T. Vanderbilt Co. Inc. embarks on a reorganization of its North American operations and expects to complete a $30 million expansion in the summer. Michelin North America Inc. launches a $200 million expansion of its Starr, S.C., tire plant, and plans to upgrade and expand its Waterville, Nova Scotia, facility. A drop in demand for some tire segments moves Goodyear to cut 241 employees at two factories. Tristone Flowtech Group has completed its expansion in Shuzhou, China. Continental Tires the Americas L.L.C. reveals it will pump another $129 million into its growing Mount Vernon, Ill., tire plant. After a long dispute between labor representatives and the company, Goodyear announces it will close its Amiens North factory in Amiens, France, cutting 1,173 jobs and leaving the farm tire business in the region. Custom Rubber Products and its molding operation becomes part of Flexitallic Group. Bridgestone Corp. begins tire production at a $540 million factory in Pune, India. Tristone Flowtech Group GmbH completes construction and plans an August start-up for its engine, battery cooling and air charge hose plant in Shuzhou, China. A federal appeals court upholds the conviction of two former Wyko Tire Technology Inc. engineers for stealing trade secrets from Goodyear, but reverses their sentences and sends the case back to a district court for a rehearing. Silicone Solutions moves into a new plant in Cuyahoga Falls, Ohio, that roughly doubles the space it had in its previous location. Rick Tillotson founds Tillotson Performance Polymers L.L.C. and opens a plant in New Hampshire to make a variety of polymer products. American Roller Co. finishes an expansion in the U.S., prepares to start another in China and celebrates its 75th anniversary. Two Nishikawa Cooper Ltd. plants in Indiana get expansions. Guayule developer Yulex Corp. forms a partnership with Versalis S.p.A. that will open a guayule elastomers operation in southern Europe by 2016. 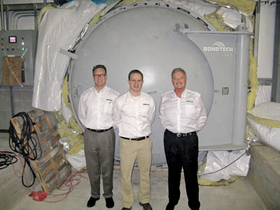 Salem Republic's James Dunchuck, James Grossi and Drew Ney show off the firm's new addition. An addition to expand capacity and improve efficiency is nearly complete at Salem-Republic Rubber Co.'s hose and calendered goods plant in Sebring, Ohio. Cooper Tire & Rubber Co. plans to add a global technical center to its Findlay, Ohio, research and development complex, a $40 million project. Universal Rubber & Polymer Ltd. decides to increase the size of its Middlefield, Ohio, factory by 36,000 square feet. A jury in an antitrust case lasting more than eight years finds Dow Chemical Co. guilty of conspiring to fix prices for urethane chemicals. A judge later orders the company to pay $1.2 billion in damages, and Dow appeals. Maurice “Morry” Taylor, Titan Tire Co. chairman and CEO, engages in an exchange of acrimonious letters with France's ministry of industry as Titan's attempt to buy a Goodyear factory in Amiens, France, fails. Titan International Inc. and the United Steelworkers sign contracts at three of the firm's tire plants. Quantum Silicones L.L.C. buys a new headquarters and warehouse building in Chesterfield, Va., to free space for manufacturing at its current facility. TrelleborgVibracoustic and HSS Otomotiv ve Lastik Sanayi A.S. announce they will merge their air springs businesses and form a separate joint venture, called Vibracoustic Blacktech. Quantum Silicones' Phil McDermott, Linda Buller, Tom Loman, Anna Clark, Chris Douglas and Matt Loman gather outside of the firm's new headquarters in Chesterfield, Va.
Trelleborg A.B. opens a factory in Wuxi, China, to help handle growth within the automotive industry in that nation. About 130 workers at the Firestone Polymers L.L.C. synthetic rubber and thermoplastic elastomer facility in Orange, Texas, strike for two weeks over management health care proposals for employees. Bridgestone Corp. decides to close its Bari, Italy, passenger tire plant during the first half of 2014. 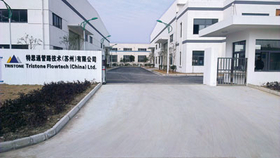 ContiTech A.G.'s Vibration Control business builds a new research and development center in Changshu, China. Brazilian automotive rubber parts maker Minas Industria de Borrachas Ltda. is acquired by Tokai Rubber Industries Ltd.